A remote seal capillary type dp transmitter which is mounted on a closed tank. distance between both flanges is 1835 mm and density of fluid in tank is 1.15, transmitter is mounted below the high side flange. please give the calculation of URV and LRV values. You need to know the capillary fill fluid specific gravity to make the calculation. It does not matter whether the transmitter is at, below or above the bottom tap when dual remote seals are used. The LRV and URV are the same for all three conditions. In many cases, the lower level (4mA) is where the bottom tap is, so value a = zero. When a = 0, then (SGp * 0) = 0. Hence, LRV = 0 – (SGf * d), which results in a negative value. That’s correct. Do not be surprised if the LRV is a negative value. It frequently is negative, as well as the URV. Remote seal transmitters assembled and filled by the manufacturer will have a part number that includes a code for the fill fluid and usually the tag will show the fill fluid too. Commonly used capillary fill fluid specific gravities range from 0.26 for glycerin to 1.97 for Halocarbon. Guessing at the fill fluid can lead to large and significant errors. Determine the actual fill fluid. At min level (empty), there is 0 process liquid pressure on the high side, so SGp = 0. 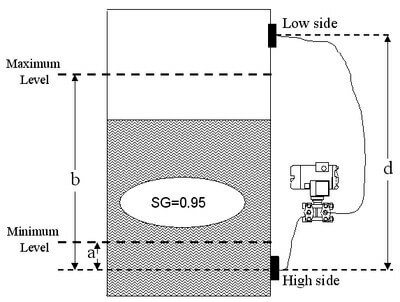 At the maximum fluid level, there is a pressure of (SGp * b), or (0.95 * 108″) on the high side. LRV = 4mA = -112.80″ w.c.
URV = 20mA = -9.48″ w.c. The transmitter’s range is -112.08″ to -9.48″ w.c., a span of 102.6″ w.c., which is the head pressure of 108″ of liquid with a SG of 0.95. Hai there, what happen if the transmitter located higher than top tapping (low tapping)? Can you explain the calculation? sir, how can we define the Distance of maximum liquid level (B)? Hello sir, how can i define the minimum level (a) , maximum level (b) and also at which point i have to take Hish side and low side tapping.